What if you could be the Grim Reaper? That's the reality in this awesome new book by Neal Shusterman. It's the future, death is a thing of the past. Nano technology means that even getting hit by a Mack Truck isn't the end. Sure, you'll spend a few days in a recovery centre while you're pieced back together, but hey, the recovery centres have the best hot fudge sundaes in town. There's no ageing, there's no disease, there's no crime. On top of this, there's no government. Instead, the online "Cloud", now known as the Thunderhead, is an all knowing, all seeing leader of the world. 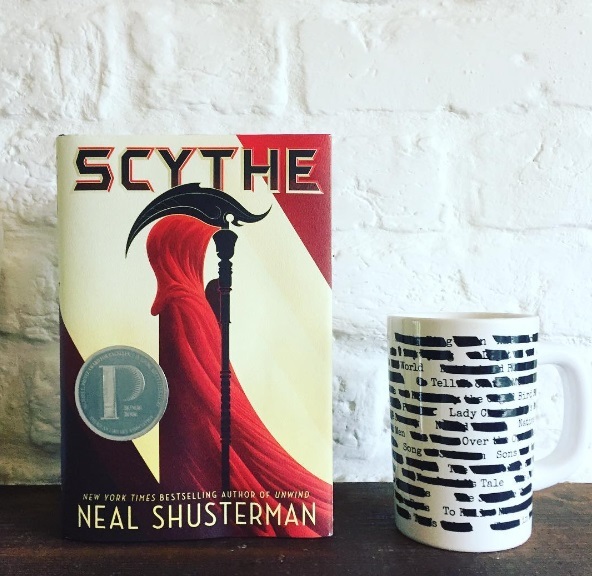 To keep the human population from spiralling out of control, select people are chosen to be Scythes, those who live a monk like existence and whose job it is to dole out death. I am part of a committee at my library system that plans social book talks- we find books that speak to pressing social issues and then we host an event inviting the public to come in and discuss the book and the issues. I am part of a committee at my library system that plans social book talks- we find books that speak to pressing social issues and then we host an event inviting the public to come in and discuss the book and the issues. This month we partnered with a local book store and we were able to bring in the authors of All American Boys last Saturday for an inspiring conversation. Brendan Kiely and Jason Reynolds are two great guys. 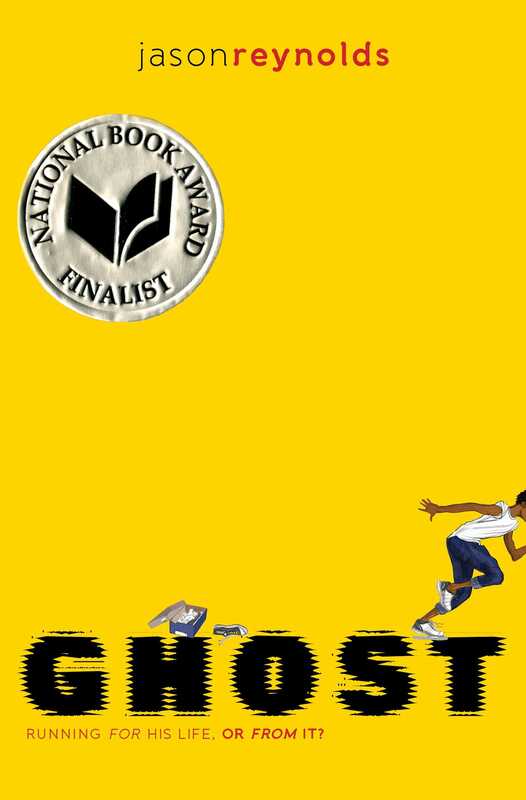 Reynolds in particular is on a hot streak and his latest book is Ghost. Set in the city it deals with a young tween called Castle Crenshaw who describes himself as having "mad and sad feelings" which sometimes leads to altercations at school.. He has had a hard life and now he and his mom eke out a hardscrabble existence in a less than desirable neighborhood. His mother works long hours to provide for them both and she has high expectations for him. He is a tough kid but not tough enough to escape frequent taunts at school from a bully. He stumbles into a track meet one day and although he isn't impressed by the coach's gruff manner and reptilian appearance (Castle thinks he has a "turtle face") he tries out. Lo and behold he discovers that he is a runner. Coach invites him to join the team and thus begins a new phase in Castle's life. This book covers a lot of topics. I like it's hopeful tone however. Castle is a kid with many flaws but he is resilient, he knows right from wrong and works hard. With those qualities he will go far in life. This is the first in Reynolds' Track series so I will definitely keep my eyes open for future installments. I recommend this book for ages 9 and up. Some read alikes are Coe Booth' s Kinda Like Brothers and Andrew Clements' The Jacket. Sometimes a book arrives with so much pre-publication hype that you cannot help but be disappointed when you actually read it. Not because the book is bad, necessarily, but because the hype created impossible expectations. 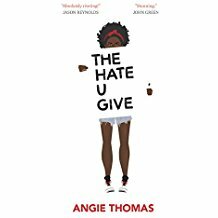 The Hate U Give by Angie Thomas is NOT that book. Impossible expectations have been met, and I cannot overstate the love I give to The Hate U Give as I join the chorus of voices praising this debut novel. Yuki Nakahara is an American. He was born here and is a citizen. His parents on the other hand, were not. After Pearl Harbor, President Roosevelt signed Executive Order 9066 which directed the removal of "enemy aliens" from coastal areas labeled war zones. Because of their Japanese ancestry, Yuki's father was sent to a prison for investigation while Yuki and the rest of his family were rounded up and sent to an internment camp in Utah. They were called traitors and cursed as "the enemy." Yuki, and many of the other young Americans of Japanese Ancestry (AJA), want nothing more than to prove their patriotism by fighting for America, THEIR country. This story is truly amazing. Reading about what these men endured, how they fought, where they fought, how they were used as assets in the European theater, and how they died was fascinating. 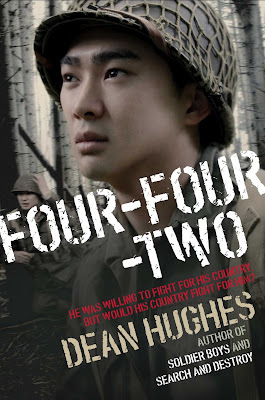 Yuki was fictionally deployed as part of the 100th/442nd Regimental Combat Team, a combat team that in real life was comprised of about 18,000 AJAs throughout the course of the war. They are still the most decorated unit in U.S. military history. Approximately 50% earned a Purple Heart and they suffered a staggering 314% casualty rate. I highly recommend this book. It is an extremely timely story! So much of the political atmosphere right now regarding Muslims in America sounds so similar to the attitude and behavior of the U.S. government its citizens around the time of World War II. Here are a couple of interesting links for more information about Japanese Americans in World War II. The mission of this organization is "to educate and inspire character and equality through the virtue and valor of our World War II American veterans of Japanese ancestry." 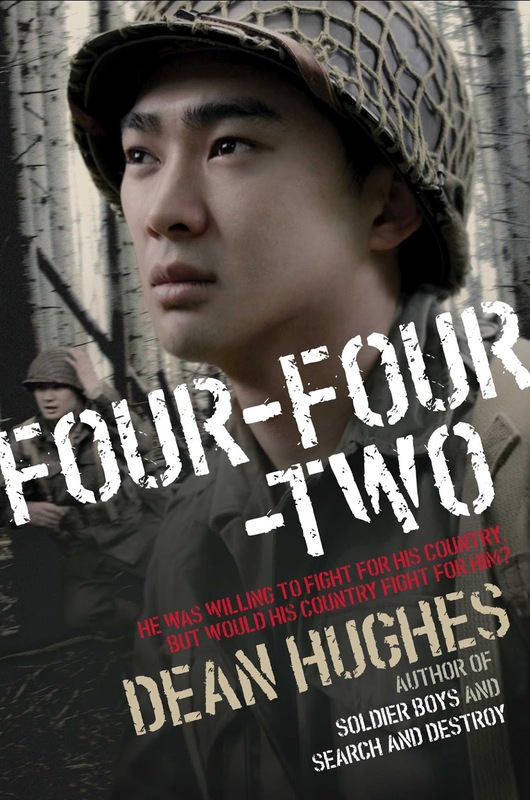 George Takei of Star Trek fame, who was rounded up and relocated to an internment camp with his family, has created a Broadway musical based on a true story of another family. Labels: Historical Fiction , History Matters , Keeping You On the Edge of Your Seat , Survival , War - What Is It Good For?